While going through boxes of old things from my family, I came upon a ton of ancient greeting cards. They ranged from Art Deco beauties to funky images from the 1960s. The longer answer requires a bit more explanation. See, most vintage greeting cards have been signed and mailed. After all, that’s what they’re for. Who needs a 1970s card to Aunt Emily from Beatrice and the kids? Other cards were stuck into albums, and the glue and tape just won’t come off. And in most cases, the cards have yellowed, browned, torn and wrinkled over time. So what’s to be done with them? Keep them, donate them, give them away. Most vintage greeting cards aren’t worth a lot of money, at least individually. But designers, crafters and artists often like to use the images in scrapbooking, decoupage and other applications – or simply for inspiration. They prefer to buy quantities of vintage cards. Other people frame them for display, which can create an inexpensive and lovely way to decorate! Back in the mid to late 1800s, greeting cards were often hand painted by noted artists such as Kate Greenaway, and featured elaborate lifestyle scenes, floral motifs, animals and other designs. They were expensive even then, so that only the wealthiest people could send them. Today, these cards can be worth a lot of money IF they’re in good condition and if they were not mass-produced. English companies such as Raphael Tuck & Sons, De La Rue and Marcus Ward & Co. are in greatest demand – one card fetched nearly $16,000! Ordinary calling cards and greeting cards could still be worth anywhere from $15 – $30 if they’re in pristine condition, unsigned and unmarked. 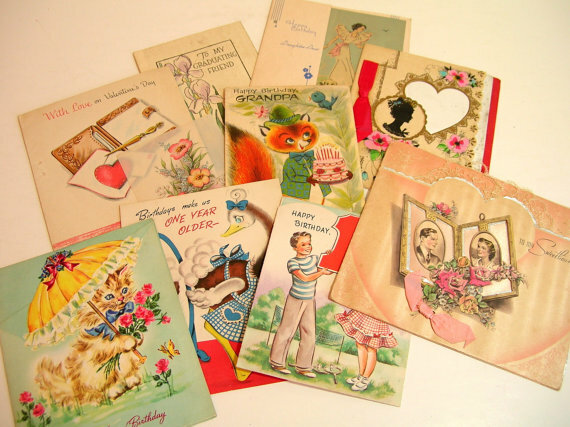 There are people who do collect vintage greeting cards; however, they tend to specialize in, say, Christmas or Mother’s Day cards, or unusual cards such as pop-ups, die-cut cards and humorous cards. But once again, the biggest prize goes to the unused cards, without blemish. How to sell your cards. Some old unsigned cards in good to excellent condition can be sold for about the same price as a modern card. Those with unused envelopes can command a dollar or two more. For the most part, they’re sold in lots of five, 10 or more. Be sure that you don’t damage them when you’re getting ready to sell them. Remove them VERY carefully from albums. Do not attempt to take off any tape or glue. A serious card collector will know how to handle that. And state any such marks in your offer for sale. Look through each card carefully. Sometimes, there’s still money or other interesting items inside! Try to date the cards. Some have dates on them; others will reflect changing card company logos, which may help. And, of course, the style of the design could be a clue. Remove them from their envelopes. If the envelope is still in good shape, keep it with the card, but don’t allow the glue to touch it. Group cards such as holiday and birthday cards together, since they tend to be sent to more than one person at a time. Anniversary or New Baby cards may be sold individually. Personally, I’d hold on to the older, more handcrafted and unusual cards. With everyone else tearing them up for crafts and other art projects, they may eventually become scarce enough to be worth something! This entry was posted in Antiques, Collectibles, Ephemera, Etsy and tagged Art Deco designs, Art Deco fonts, collecting vintage cards, craft ideas, craft supplies, De la Rue cards, design ideas, Edwardian greeting cards, film props, how much are old greeting cards worth, how to sell vintage cards, Kate Greenaway, Marcus Ward & Co, movie props, old greeting cards, old images, Raphael Tuck, scrapbooking supplies, scrapbooks, stock photography, theatre props, value of old cards, value of unsent cards, value of unsigned greeting cards, value of vintage greeting cards, Victorian greeting cards, video props, vintage graphics, what are old greeting cards worth, what are vintage cards worth, where to find vintage cards. Bookmark the permalink. 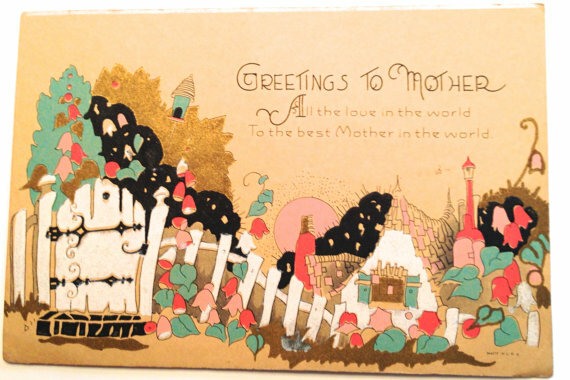 52 Responses to Are Vintage Greeting Cards Worth Anything? Yes. And No. I have a what appears to be a hanwritten Christmas greeting card, copyright H.H. & Co. Image of one penny dated 1887. At the top it says – My Christmas Greeting, The Only Brown, followed by a poem. Just wondering about value and any other info. I have a shoebox full of unused cards and envelopes from the 50’s to 70’s. They include: Get Well, Baby Congrats, Recovery, Secret PAL…etc. Ther are a mixture of religious and non-religeous. I have no idea what to do with them. 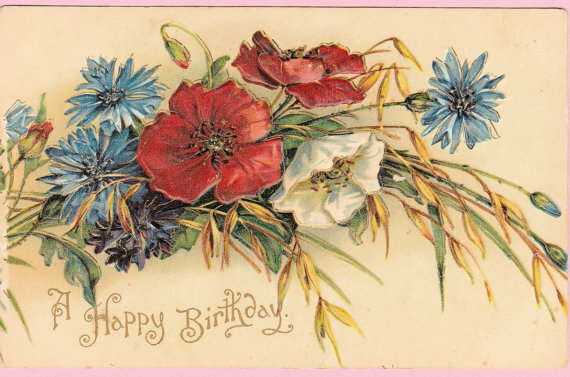 I have old greeting cards from 1800s that are in perfect condition without writing on it! I have a gallon zip lock bag stuffed with un-used old greeting cards. Some have the envelopes; probably most of them. They are from prior to 1968. I have about 30 to 40 pristine cards from the 70’s (with envelopes) that I would like to sell. They are for different occasions. Would you tell me how to go about this. If they have an unusual theme or are particularly pretty, you could try to sell them at a yard sale for a couple of dollars each. 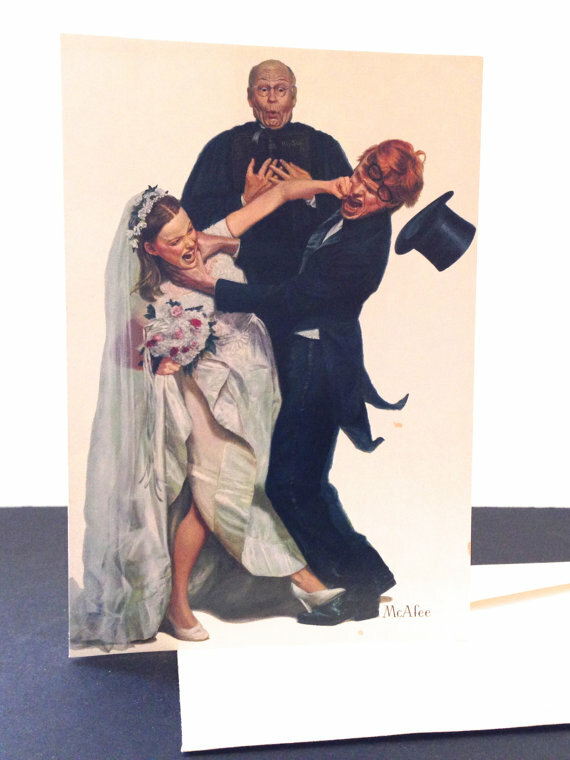 I was able to sell my “marriage” card for about $10 only because it was such an unusual card, by a relatively well-known artist. My other cards just sit in albums because they’re not good for much other than scrap for crafters. You missed two other option for vintage cards… first try to find the family member to or from whom the card was sent… some genealogists, like myself, love to add such personal memorabilia to the family ‘book’. Another option is to donate ones in fairly good to good condition to a museum or local historical societies. They make great displays, especially for seasonal cards. Just some added thoughts. …. oh and another is to create a collage of them and frame them. I did this with old family and friends Valentine calling cards that I found in my husbands great grandmothers things. People who visit our house just love it! Some Pollyanna cards also Christmas not written in. Ann, would be interested in buying them if you still have them. I just saw this post. I have a 2″ stack of used/signed cards for the 50’s and they are in great shape. Anyone want them? Hello, I’ve rediscovered a batch of birthday postcards, unused, embossed round the edges. I just wondered if you would have an idea of a date. I like them as a small piece of social history but would love to know more. Any ideas? Is there any way you could upload a photo? Unfortunately, probably not much since it’s been written on. The ones that are worth the most are also handmade and VERY old. Do you have the names of any specific people who are buying vintage cards? I inherited an 80 page card album (5-10 cards per page) from my great grandparents. These are all from the late 1800’s and some are very elaborate – cut-outs, some trimmed in fringe, etc. Many are from businesses, churches theaters who were advertising. They are just the front of the card because they are glued onto the card album page. I am interested in selling them but don’t know who to contact. They lived in Kansas City Mo. so a lot are from businesses in that area in the late 1800s. Thanks ! I’m not very familiar with vintage business cards; however, I would think that they might appeal to people in the industry they advertise. For example, I have seen cards for tattoo parlors being sold to those in the tattoo business. I’d imagine they would make a great decor item in the shops. I have 10 complete boxes of Christmas cards from the old Wool Worth stores from the 1930’s. They are assorted cards with 15 cards per box. They are pristine with envelopes and never used. Even the boxes are in great shape. Is something like that collectible? I found 3 cards in picture frames at a car boot, from what I’ve found they may be limited addition and they haven’t been wrote in. They are Anne Wilkinson at Hunky Dory, Winnie the Pooh drawings and printed in England. I’ve no idea of the age but I know there were other items made at this time ie money boxes as I have one I’ve kept from my childhood. Could these be worth anything in the future? I have a postcard dated 1812, popup type as new with many pictures in the post mans bag , not sent to any one -as new . would it be worth anything ? I have suitcase of old xmas paper,folded in the packs,most unopened,id say probably from early 60s,maye 70s, any value? I’ve been collecting old greeting cards for 20 years. People in my area know that I have been gathering them and often drop off their dear loved ones collection for my use. I have been delighted to see the sentiment written in each card….helps me know the person to whom these cards have been given to. Have been using them when I remake other personalized greeting cards. But really hadn’t done much with them for a while….UNTIL this year when my husband renovated the basement and gave me a huge craft room to work in. So all the cards that I have had in storage is out…and I’m going through them one by one….cutting them apart….die cutting individual pieces I can use in future projects. The lovely messages inside I cut out as well, also for future use. I’ve been making personalized greeting cards for my friends and family only….but now I think I will try to expand….and I’ve come up with a catchy name for my “recycled treasures”….”Greetings from Re-Card-O”!! I’ve designed a cute little mustached man holding a tray with a card on it for my logo. It’s amazing what one can do with old greeting cards. And the funny thing is….I just found out that my grandmother use to do the same thing!! I hadn’t a clue…. Do you live in Arizona? I have a bunch of 1910s through 1945. All kinds from get well, to holiday ones. They are used. But in great condition. Some are from Germany!! Give me a shout if your interested in meeting up. I have several vintage Hallmark Christmas cards that I can’t find anywhere online. My mother ordered these from before 1963 until up to 1973. The cards had a theme and slots in the front. You ordered family characters that were card stock and had long tabs on them that went in the slots. Each tab had the name of the character. (i.e…. I was the little girl character and my name was written on the tab). Do you know anything about these? Many years ago I got a box of cards. The box I think is from the fifties. It is filled with so called pretty button cards. 16 cards and 16 envelopes. Very goodcondition,unsigned and unmarked. To say very complete. I have some foto’s from all the cards and the box. On the box the tekst: Pretty buttons. All birthday assortment. 16 cards and 16 envelopes. All with buttons. I would like to know what can be the worth of this box. Is there a possibility to send you yhe photo’s. You could stuff as many as you can fit into a Small Flat Rate Priority Box for about $6. St. Jude’s would love to have them! Just wondering if you ever got rid of your cards??? I know your post was a few months back now so you probably have. Anyway, I would be interested in them if you still have them. I collect ephemera so am always interested. I think the best way to sell most of them would be for scrapbooking. You can look on sites like Etsy to see what “lots” of cards are selling for. As for the unused cards, you may be able to sell them for $5 – $10 each. If they’re very elaborate, extremely old or hand painted they could be worth more. If you don’t have an online shop, you could try to sell them in a yard sale; however, you wouldn’t be able to get the same price as you would in a shop. Another idea is consignment at a local antique store – or, perhaps you could post a notice in a craft shop. Barbara, if you still have these I would be interested in buying them from you. We have a Raphael Tuck and Sons Christmas Card with a short inscription dated 1905. Where can we send a scanned image to to get the card appraised. I don’t know of any site that appraises greeting cards, unfortunately. You could search sites such as Etsy and Ebay to see what similar cards are selling for. I have an opened box of get well cards that have surfaced since my mom passed away. The box says originals from Denice (correct spelling) – deluxe Elegance assortment. I don’t see any dates on them. There are 19 cards plus the envelopes- on the back of each card has “A select card” with a capital red G underneath. Do you think they are vintage. The “G” is most likely Gibson Greetings, a prolific manufacturer of greeting cards. Some of their designs have been reproduced in recent years due to their cute retro graphics. I’m Black I don’t like being call Africa America because. If you look in my heritage you will find a melting pot of people .I truly love vintage black cards far and few I’m 62 the way we are shown is how it was and it is true we were slaves couldn’t read or write or dress the way the white we should not be shame of our pass but look how much we’ve changed I collect and hope my family can see how far we have come in my family I have doctor,teacher, PHD, computer program.these are my children and grandchildren also niece ,nephew so saying all that I feel that they are priceless. Is there any market for WWII cards, signed, most were kept in envelopes so they aren’t yellow. Most are birthday & Christmas. Most cards are 1930-40’s. Hi, Ann: From what I understand it would depend upon the images (are they specifically referring to WWII?). I would think you might be able to offer them as lots – separate the birthday from Christmas. Another thought is that you could offer them on pages devoted to military memorabilia.